For many women, getting screened for breast cancer is something they avoid, simply because they feel they do not know what is best for them. With so many different screening tools, it can be difficult to navigate what is best for you based on your current health, previous screenings, family history, and so on. 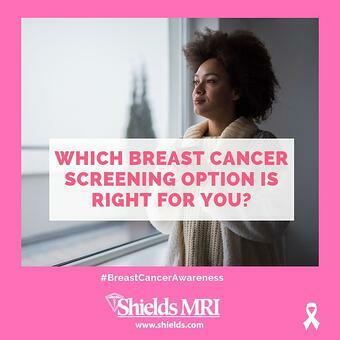 As part of Breast Cancer awareness month, Shields has reviewed some of the top screening options to try and clear the air on breast cancer screening – learn which of these options might be right for you. - Have gone through menopause. It's best to check about a week after your period, when breasts are not swollen or tender. If you no longer have a period, examine your breasts on the same day every month. Self exams are performed to detect changes that could lead to breast cancer. These exams help you to learn what is normal for your breast tissue. All women should have this exam as part of their routine exam. Women in their 20's and 30's should have a breast exam once every three years. Starting at the age of 40, women should have one every year. Your physician examines your breasts. Physicians are trained to look for subtle signs and changes. Generally, all women starting at age 40; women who are at high risk may need to start earlier. For women at low to average risk - once a year. High risk women may need to have them more often based on their physician's recommendations. An x-ray of the breast, using a special low radiation camera. The image is printed on film. They are more effective for women who have dense breast tissue. An x-ray of your breast, using a special low radiation camera. Rather than the standard film, an electronic image is seen on a computer. Takes many more pictures than the standard mammogram. The computer screen can be adjusted for better clarity and view of your breast. An ultrasound test may be used to take a closer look at areas of your breast that your physician still has questions after clinical breast exam and mammogram. Recommended by your physician or by your radiologist. Uses high frequency sound waves that are transmitted through breast tissue from a hand-held unit called a transducer. These sound waves bounce off breast tissues. The "echoes" created as a result is then recorded by a computer that makes a computerized image of the breast tissue. Women with two or more close family members who have had breast cancer (parents, siblings or children), or those that meet specific guidelines determined by their physician. Only once. Recommended by your physician. A blood test to analyze the DNA for genetic mutation. A gene mutation is a permanent change in the DNA sequence that makes up the gene. Women who have a diagnosis of breast cancer with positive axillary nodes. PET CT scanning is an entire body scan. PET CT is used to determine if disease has moved beyond the breast area. Should you and your physician find that a breast MRI is the right tool for you – Shields MRI has a number of locations throughout New England that offer breast MRI services. Find a location via our website, at https://shields.com/find-location/ .